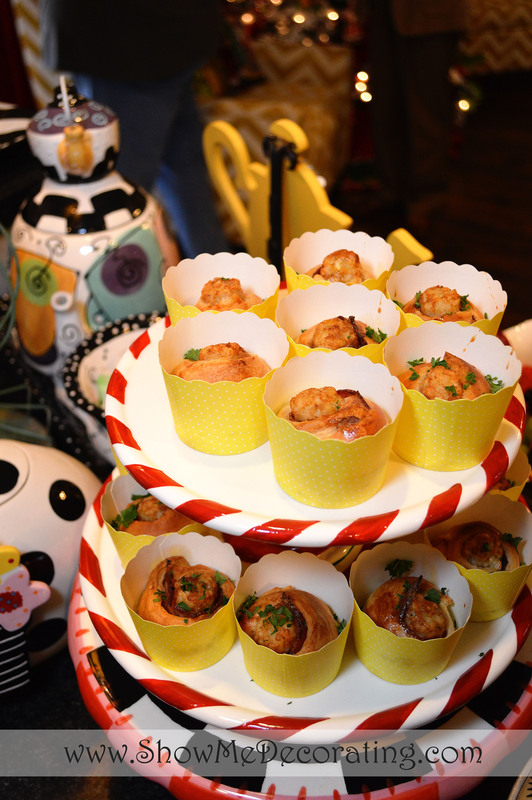 Miss Cayce's and Pecan-Pie Muffins, Oh My! 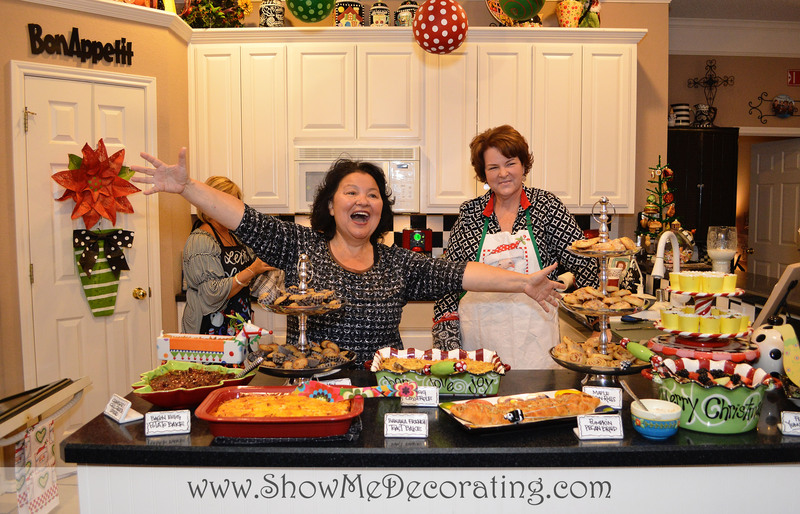 “Theming for a Lifestyle” is a mantra Kathy and I live by! Why you may ask? It narrows down the choices and creates focus and direction in decorating, for a party, your home decor, a celebration or event and your Christmas Décor. Because the Christmas tree is your largest Christmas decoration it is only natural for it to be front and center! We created several new themes for Vickerman’s Showrooms in Atlanta and Dallas. We hope you are inspired to try theming for the 1st time or incorporate one of our new Show Me Decorating themes in your Holiday decorating! Chef Santa serves up sweet treats of colorful concoctions from cupcakes to lollipops. Glittered ribbon adds an extra touch, and don’t forget to sprinkle in the multicolor candy polkadot balls. Yum! 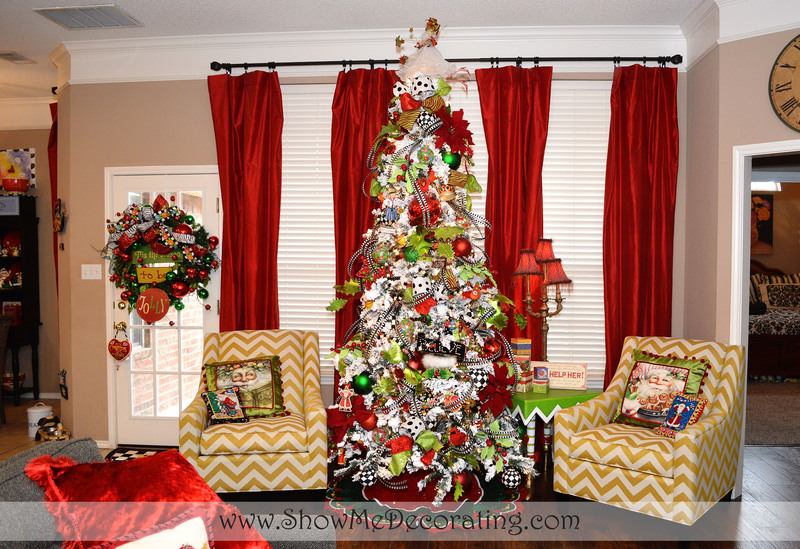 A Flocked Christmas Tree is the perfect base to highlight this fun mix of colors. Add in your favorite collection of gingerbread ornaments, perfect for a kitchen or breakfast room! Peacock Splendor with regal gold accents. Peacock Splendor Christmas Tree Theme is majestic shades of turquoise, blue, green and gold. Strutting a color palette that matches your homes decor will compliment the celebrations. Picking core ingredients that reflect your taste and personality will give your home its own one of a kind look and style. The gorgeous Blue Green Tinsel tree shows off all the fabulous shades of blue. Add in your personal collection of gold, crystal or peacock ornaments and you are set to celebrate! Peacock Gone Wild, slim or narrow Christmas tree works well as a living room tree! Leopard print ribbon, balls and ornaments added to the Peacock Tree Theme are a perfect match to our homeowners living room. Our Show Me Decorating step by step techniques will help you decorate like a designer! Deer, birds and furry creatures will celebrate the Christmas Season with the Enchanted Forest Christmas Tree Theme. Glistening icicles and snow tipped branches, Christmas holly and Red poinsettias transform your Christmas into an Enchanted Forest! Frosty woodland snowmen and critters play amongst the CHristmas Forest shades of greens, rich ruby reds and accented with platinum sparkle and a touch of rustic burlap. Curl up next to the fireplace on a holiday night and celebrate the Christmas season in an Enchanted forest! Follow all our decorating How To and bring out the designer in you! 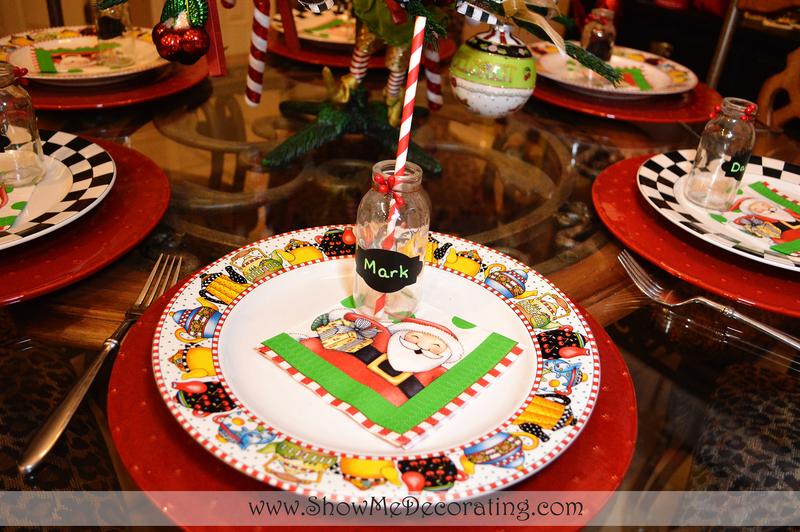 Next post we share 3 more Christmas tree themes, Peppermint Twist, Christmas Sparkle, Metal Mix and more. Bows, Bows, Bows, so many ways to tie a bow! Have you downloaded our Bow App? It will show you how to tie a beautiful bow that you can add to so many things! For Wreathes, we love to use a Clover Bow and layer it with several ribbons. Choose a wired ribbon and practice until you love it! Shape the bow out and wire it into the wreath. 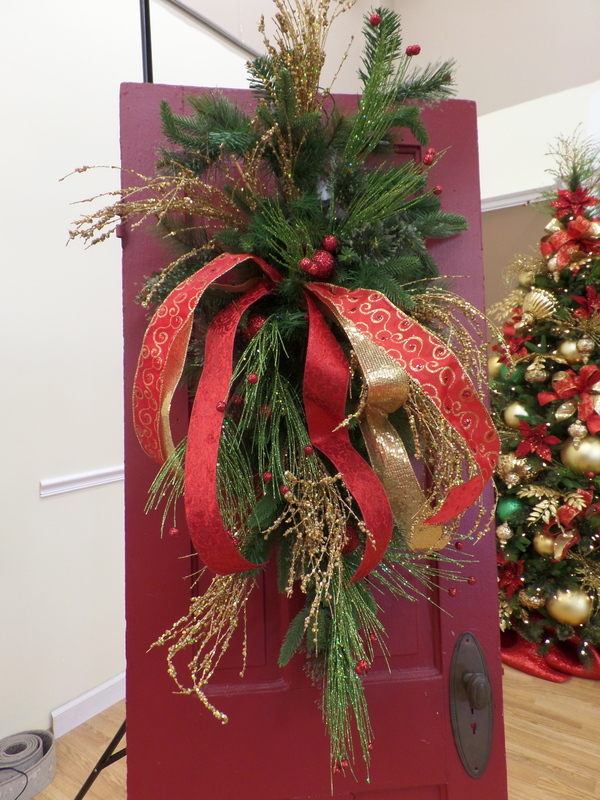 Ribbon tails weaved into the wreath add extra dimension. This week, we had a great time at our Fiesta Make it and Take it Party. 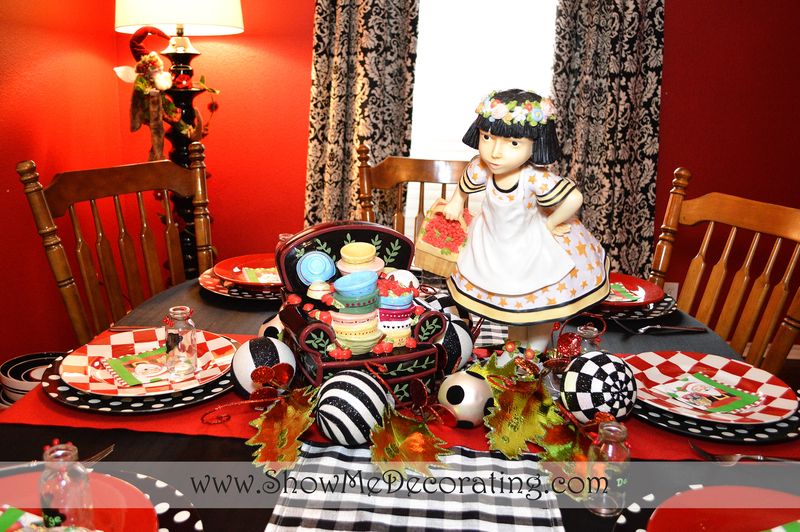 It was so much fun to share the How to of Show Me Decorating! Valentine Conversations Hearts and Christmas Garland? I will show you my Christmas doorway turned Valentines with Conversation hearts and ribbon! Show Me Decorating Door Decor! I love to re-purpose, re-use and recycle my holiday decorations. My Christmas doorway this year was a Red and white color story, complete with Santa faces and candy canes. After Christmas I removed the Santa faces and Candy canes (they were wired on) and stored them away with Christmas. I left everything on on my green pine garland that is attached to permanent screws around my doorway. Red and white ribbon, a white sparkle garland and all the assortment of red, white and red and white patterned balls. Valentines is a favorite holiday celebration for me. Probably because I Love, love, love RED, and my birthday is February 12th. I love to throw a party for myself and decorate for valentines day! My next favorite color (or color combo ) is Black and white! I have collected serving platters in black and white to use for many celebrations! So it was only natural for me to add Black and white in with valentines day! I collected my new wooden conversation hearts from Adams and Company and my stash of Black and white polka dot ribbon ( Love polka dots too!) and transformed my Christmas garland into my Valentine Doorway! Love is in the air! I turned the pillow around to the blank backside. 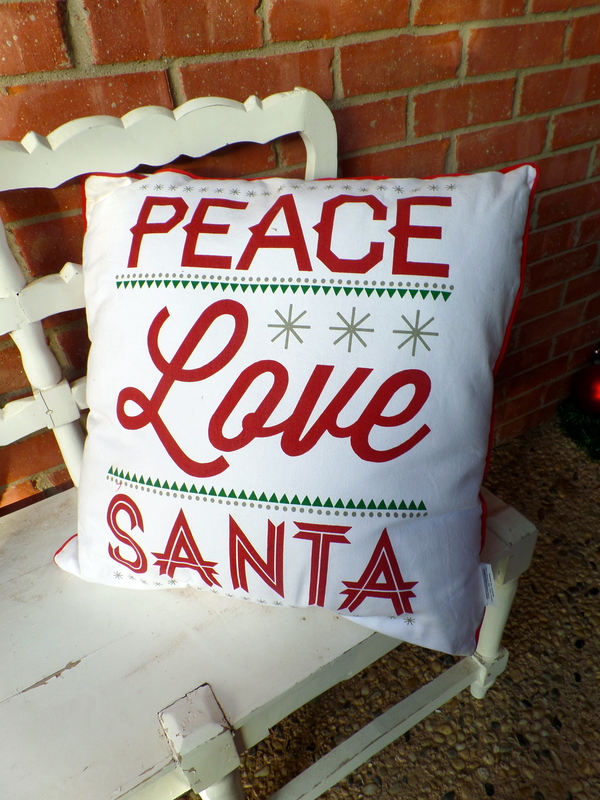 Tip: Ribbon is a quick fix to a tired, out of season or plain pillow. 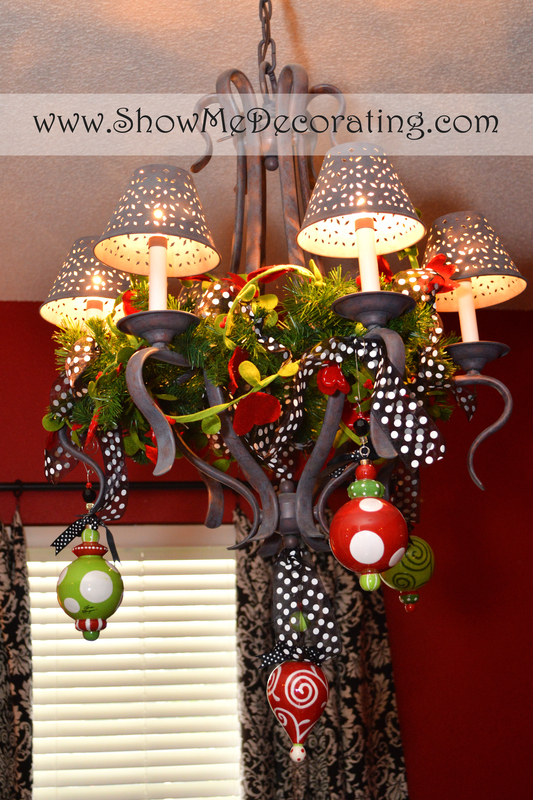 It can easily dress up or add a holiday touch! 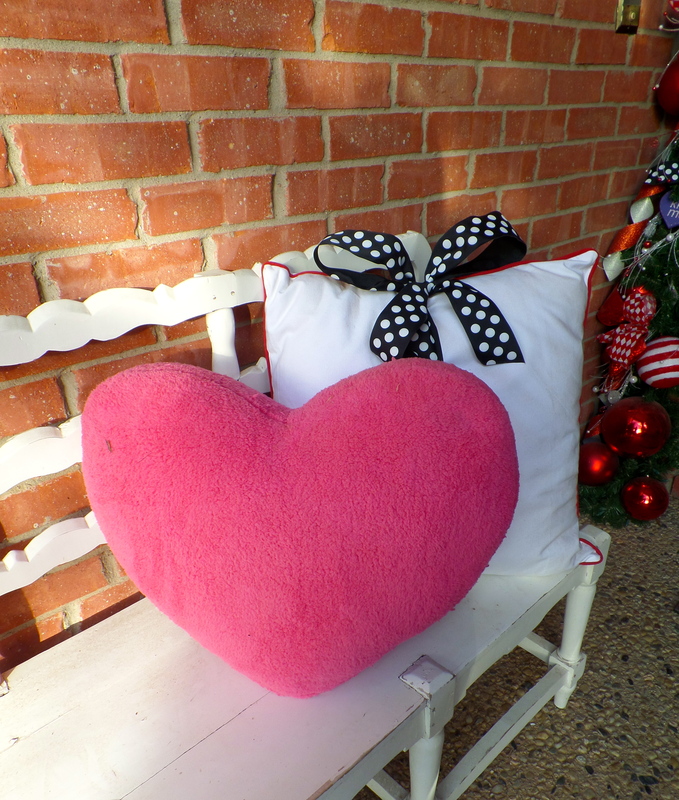 This pillow was a great investment, this is the 2nd year for it to be a part of my Valentine Decor! The fabulous Puffy heart is part of the Lisa Frost Collection available on ShowMeDecorating.com It was the color inspiration for the Show Me Valentine door decor! Love is in the air……. are you decorated? ……. 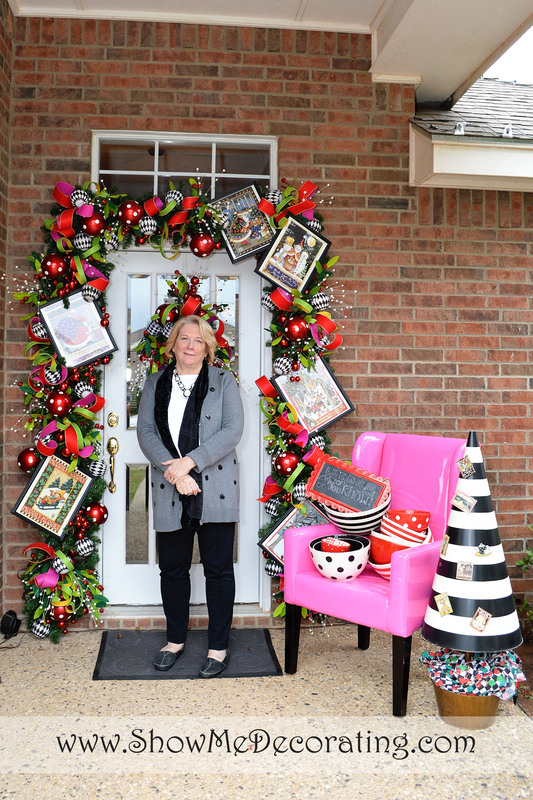 the next door decor feature will be Alta Lynn’s Mary Engelbreit doorway turned to valentines Day! The Conversation hearts will be my Theme for my valentine decorating this year! Next is to plan, decorate and prepare for my Birthday/Valentines party! How about adding a little LOVE to your chandelier? I did and I love it! I was blessed last year to redo our kitchen and when I did I knew I wanted a light fixture that I could decorate for the holidays! 2. I wound the decorative red pom pom garland up the chandelier and the heart garland around the candle lights, then added my black and white check balls(I love to use these for Halloween, Christmas and Valentines). 3. 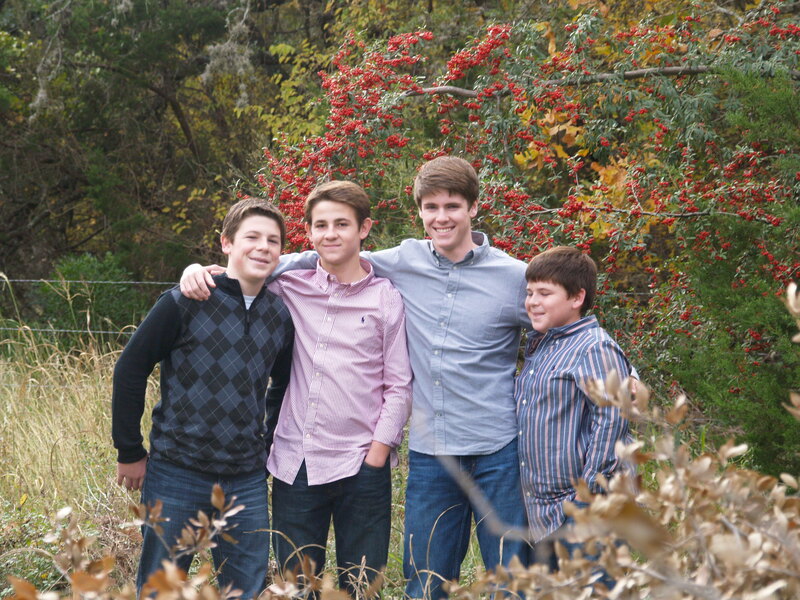 Show Me Bows are a perky touch of color for this house of boys! I love to mix ribbon together but for something different I alternated plaid bows and solid red bows. 4. I added a glittered(every celebration needs a touch of glitter) Heart as a focal point. I hung it high enough to not interfere with family dinner discussions which are quite lively in our house-did I mention that I have 4 boys? Then I added a cut out Valentine runner(from @Target) and my @Coton Colors Happy Everything plate with #Valentine attachment. Happy Valentines and spread some LOVE! Show me your Christmas card and I will show you mine! 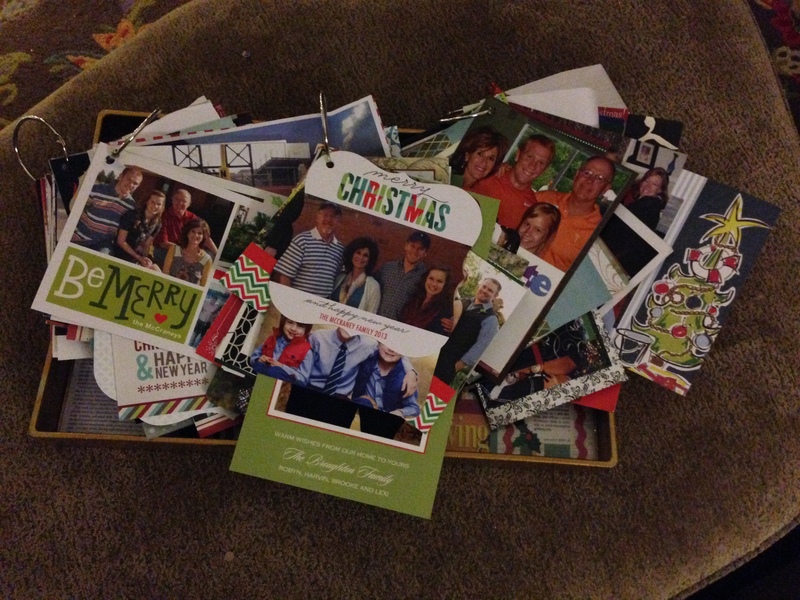 For years I have sent out Christmas cards to family and friends. 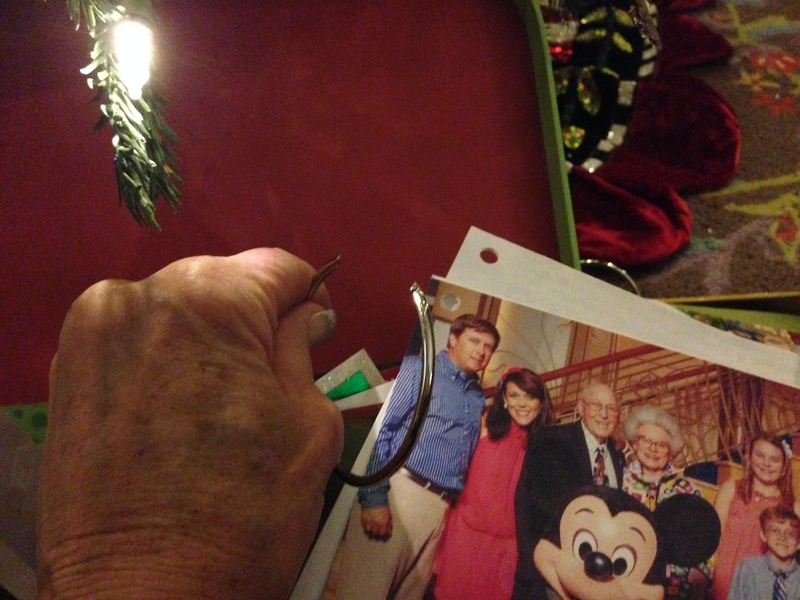 It always included a picture, sometimes a collage of pictures and possibly a short update or letter about our family. I also receive many cards and photos and love to decorate with them during the season. However when Christmas has come and gone I can never bring myself to throw them away. I would bundle the year together and place in a box or closet somewhere, tucked away. That is until a friend Krisann Blair (Organizing Christmas ) shared her idea of hole punching the cards and using binder rings to create a book. 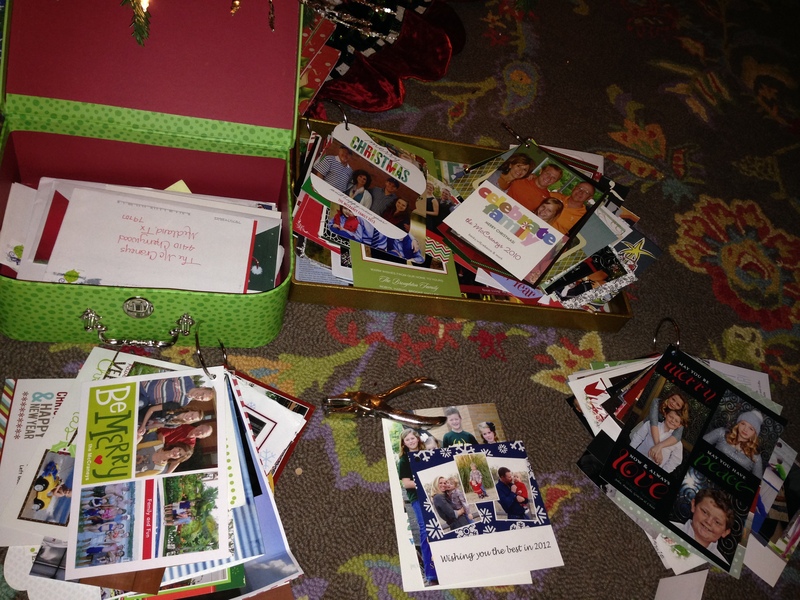 Stacks of Christmas cards and letters, ready to create a Christmas card flip book! Step 2: After all are hole punched, open Binder ring. 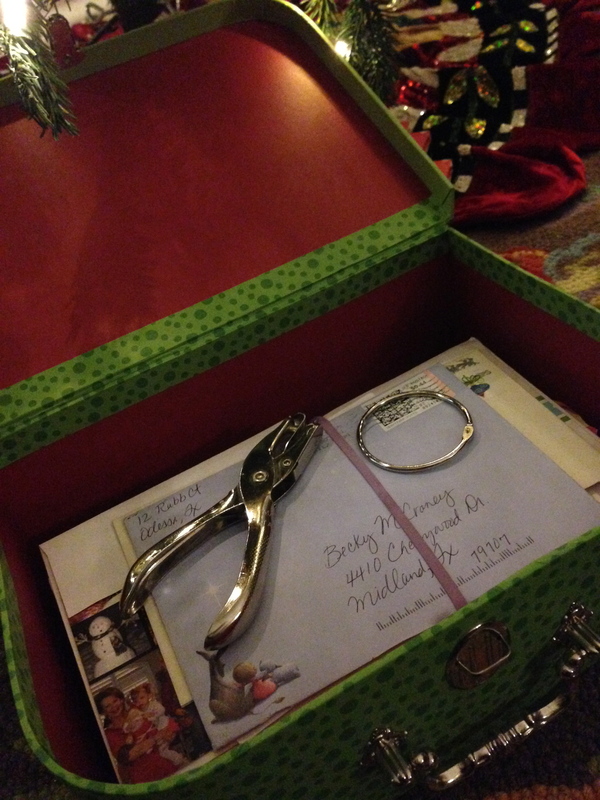 Step 4: After all letters and cards are on ring, snap shut. 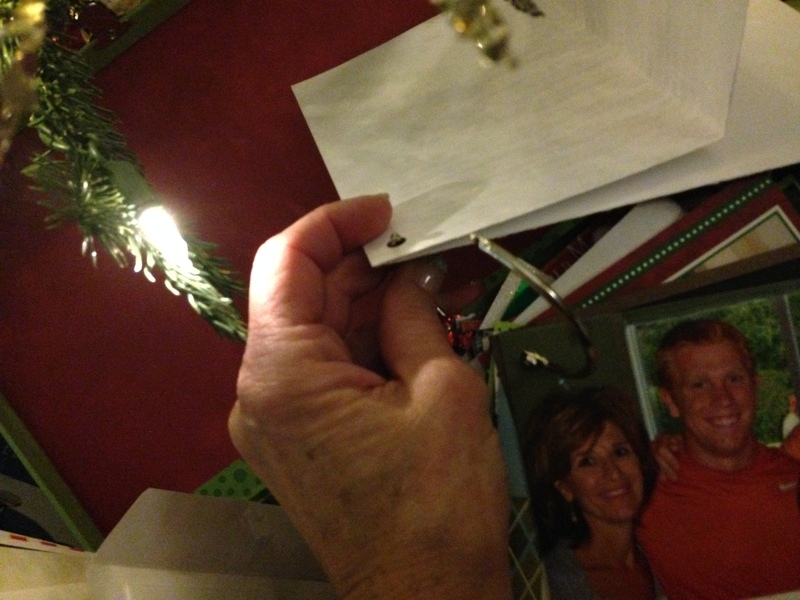 Step 5: Keep each years cards together and attach onto a separate ring. 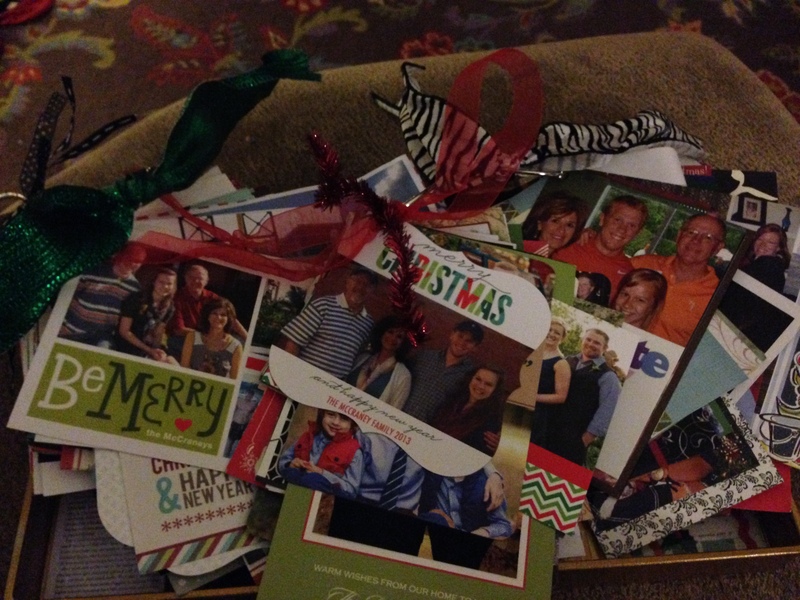 3 Years of cards and letters organized into a Christmas Flip book. Finishing touch, add a touch of ribbon tied to binder ring! I decided with all the different size cards and letters I would put a hole punch in the top corner and place on the ring. I also added a length of ribbon for a finishing touch. We all enjoyed looking through the past years and how everyone has grownup, gotten taller or shorter, slimmer or ….well you know! 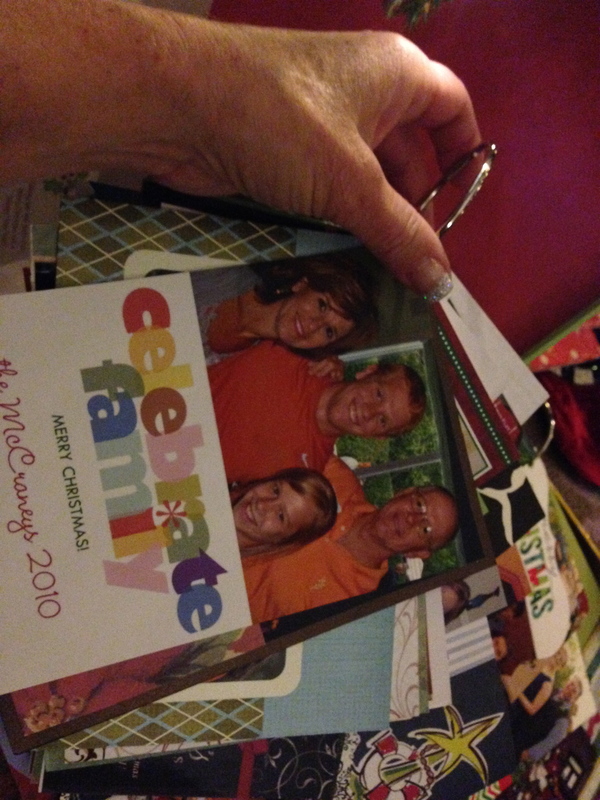 It is fun to enjoy our family and friends through their pictures and letters and I am excited to see how many more stacks I locate from past years as I clean out and reorganize for 2014. Now I have a way to keep them organized and out on display. 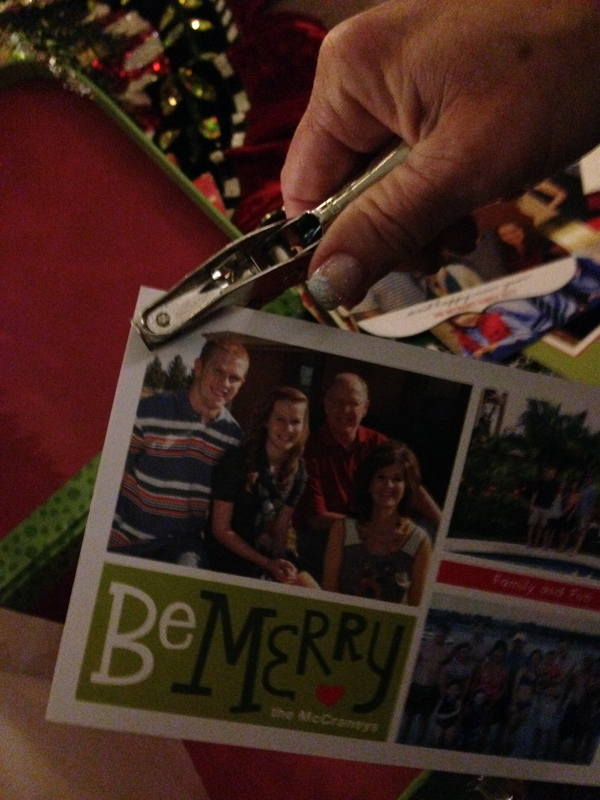 So now you too can Show off your family and friends Christmas cards and greetings! Happy New Year! Happy Decorating Y’all! PS If you too will be cleaning out and organizing your home be sure and visit Krisann for more great organizing ideas….Here is a short excerpt from her site. Do You Know the Christmas Secret? Merry Christmas! My name is Krisann Blair, founder of ChristmasOrganizing.com, here to be your Christmas Coach and help you prepare for the 2013 Christmas holiday season. Everyone celebrates Christmas differently and Christmas Organizing is here to help you develop a personal plan to create a more organized Christmas celebration. Since December 1998, Christmas Organizing has been a resource for thousands of people just like you by helping coach them on ways to have a more organized Christmas season. So what is the Christmas secret I am talking about? The secret is . . .
Show Me Pecan-Pie Muffins, Oh My! 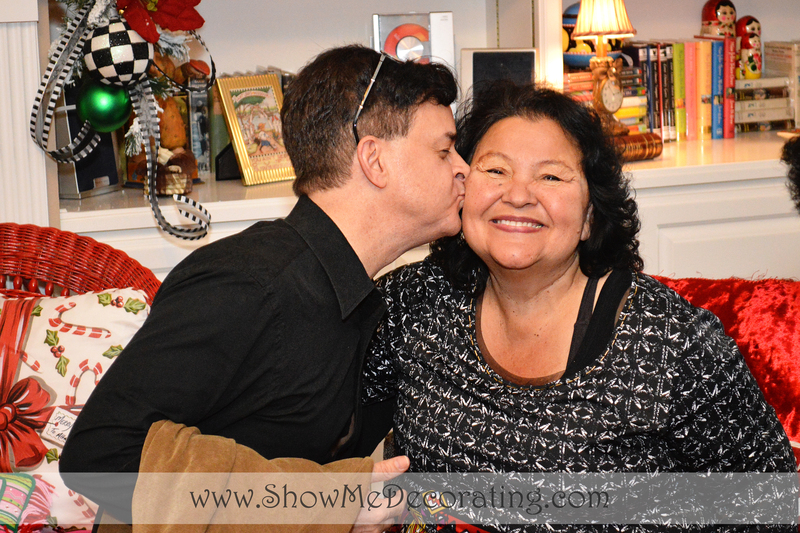 Miss Cayce’s Christmas Store, Mary Engelbreit and Mark Roberts, signing event and Brunch. We are so blessed to have amazing friends and team members who worked so hard to help us host this amazing event! 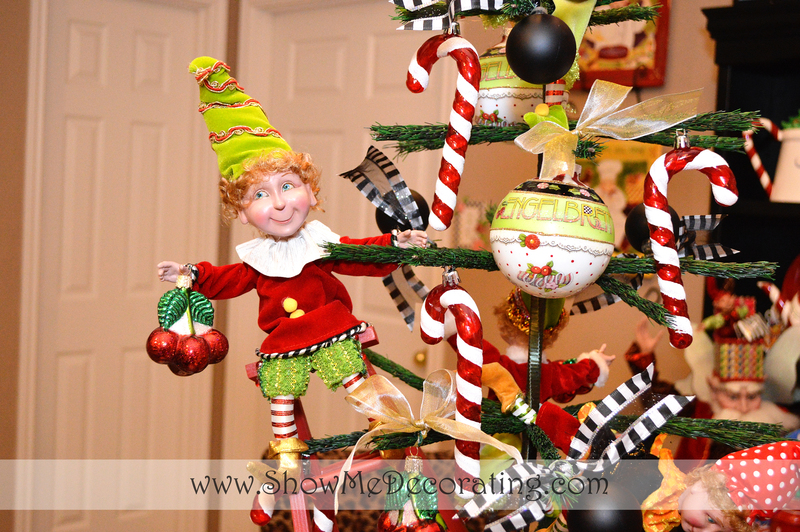 Alta Lynn’s house was a whimsical wonderland of Mary Engelbreit inspiration, vintage and new and Mark Roberts Christmas Magic! We hope you enjoy the delicious recipes and Show Me Decorating tips and ideas for celebrating this glorious time of the year, Christmas. Pecan-Pie Muffins were voted a favorite! Trisha Yearwood shared this recipe on her cooking show and it was everything we hoped a Pecan-Pie muffin could be! Show Me Decorating tip: Presentation! 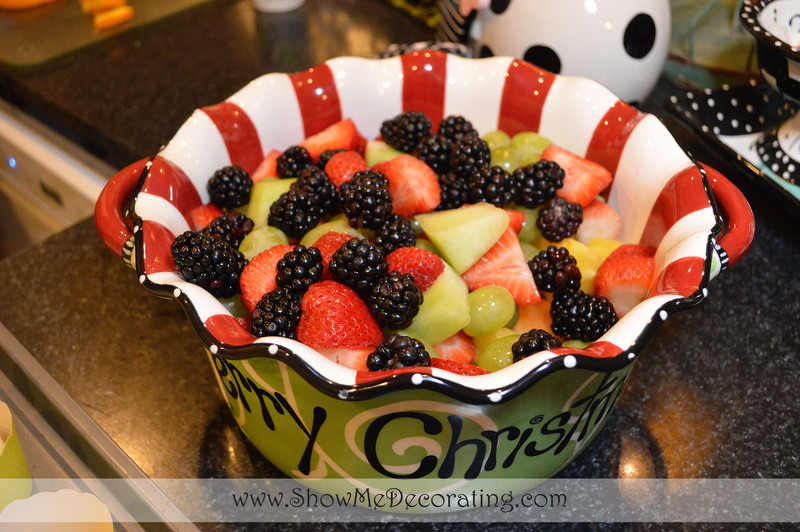 Collect serving pieces in your homes color palate, example Alta collects all things Black and White, checks, stripes and polka dots, these mix in with all her bold colored dishes including Christmas. 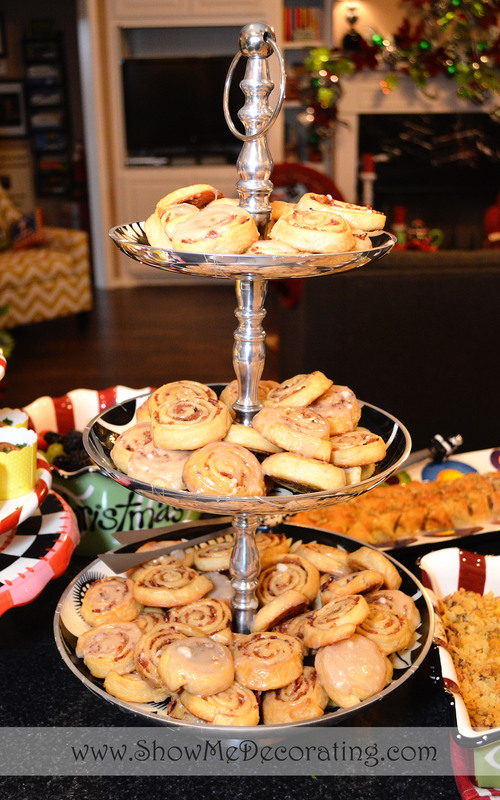 Silver cake stands, trays and tiered servers are a great neutral color. The silver also adds the Christmas sparkle! 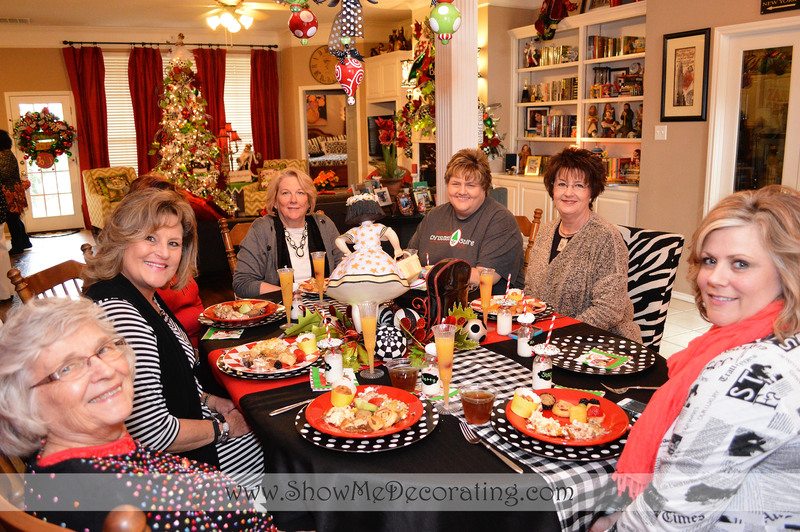 Pick a theme: Christmas Brunch, choose a color story: Red, Green, Black and White, gather from your dishes and borrow your best friends especially if y’all decorate the same! Bacon-Egg Breakfast Bites had a surprise tater tot in the middle, yum! Bacon-Egg Breakfast Bites was a delicious breakfast all in one bite treat! Featuring the bacon-egg breakfast bites in a yellow paper cup was genius! Tricia planned for weeks and researched, baked and taste tested many recipes before she found a balance of salty, sweet, tangy and spicy! She then set out to find napkins, paper cups and fun goodies to present the wonderful creations in! 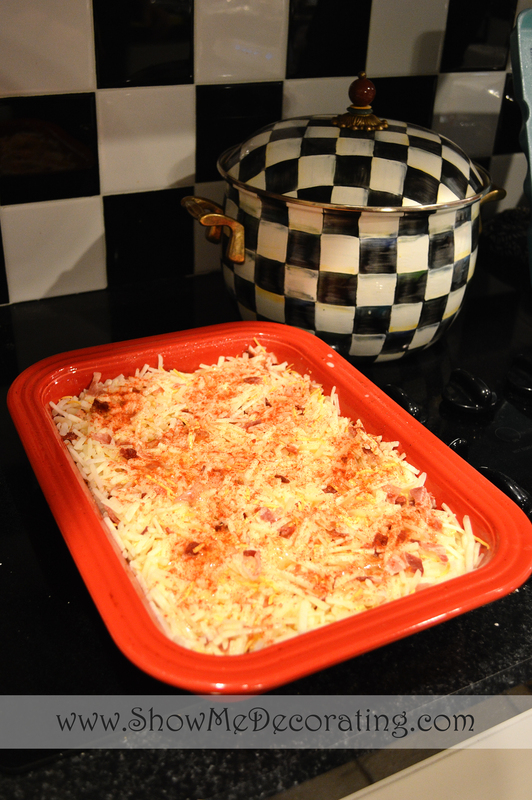 Brunch Egg Casserole serves up beautifully in a Christmas casserole dish. The Brunch Egg Casserole was a great dish to make the night before. Maple-Bacon Breakfast Rolls were the perfect mix of salty and sweet, it was like dipping your bacon in syrup while eating a bite of pancake! ……..and we have to share one more! 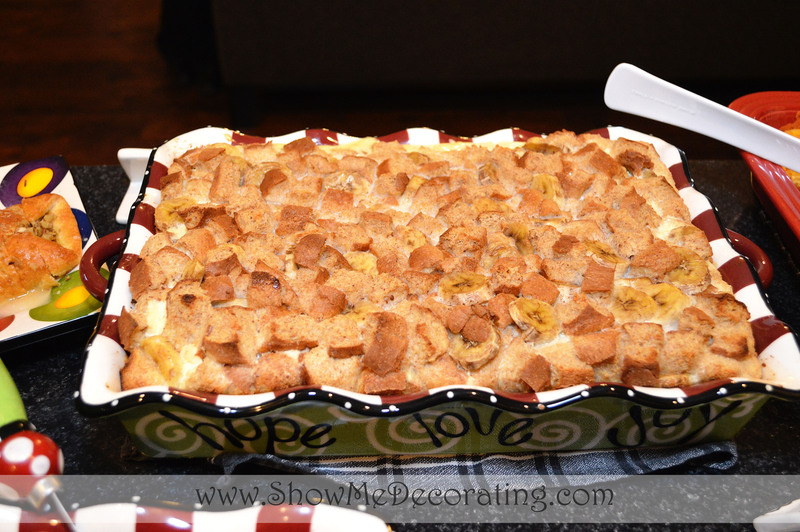 Banana French Toast Bake, is festive, served in an oven proof casserole dish! 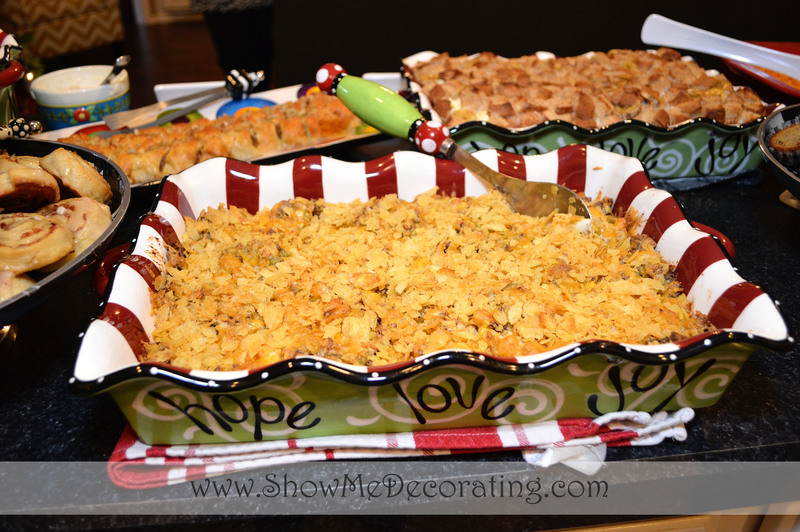 Burton and Burton is a favorite supplier for Miss Cayce’s Christmas Store and they create the best oven safe Christmas and holiday dishes ever! 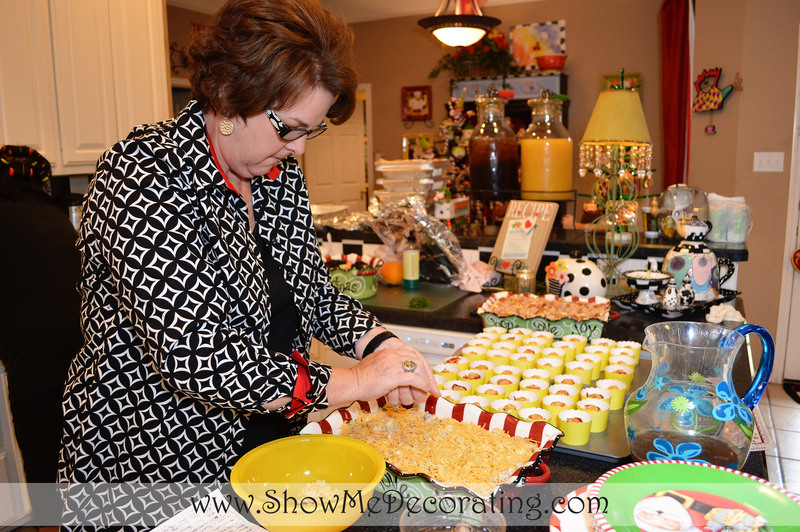 Show Me Decorating tip: Collect serving/baking dishes that go from oven to table, or fridge to table, less cleanup! Enlist “friends as helpers” says Alta Lynn and Sheri is that kind of friend! Red and black and white check, no better combination! Mary Engelbreit inspired back splash at Alta Lynn’s. McKenzie-Child pot is a perfect accent! Alta Lynn’s house was the perfect backdrop for this fun brunch honoring Mary Engelbreit and Mark Roberts. 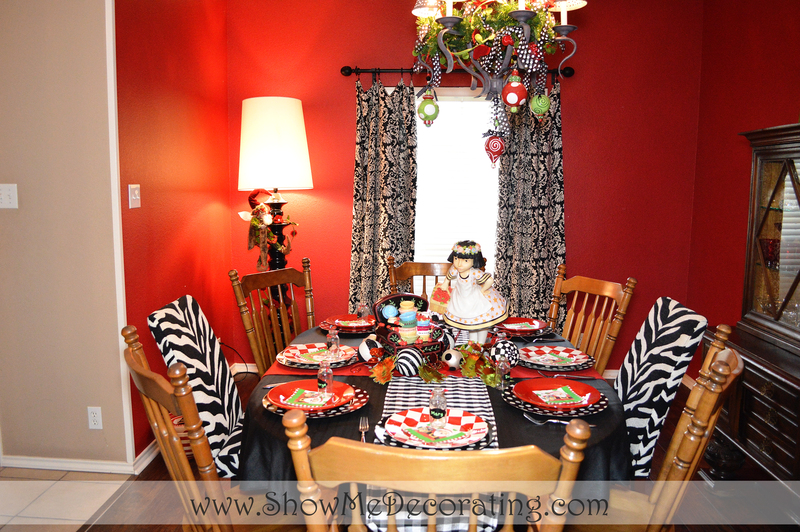 Bold red curtains, chevron chairs and a flocked tree pair perfectly with Mary Engelbreit ornaments and decorations. Becky and Mary trade decorating ideas with a loyal fan. 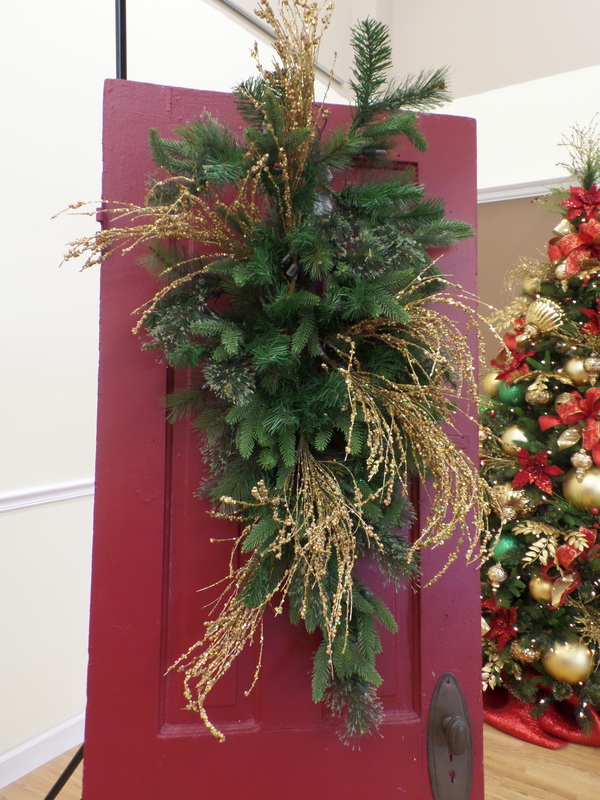 Show Me Decorating tip: Hang a wreath on the inside of your door to enjoy! Fun ribbon and focal point create a whimsical wreath. Mary Engelbreit Sprites by Mark Roberts hang on to this feather tree adorned with Mary Engelbreit ornaments. Believe…says it perfectly, Faux garlands and greenery are the perfect base for decorating this mantel. 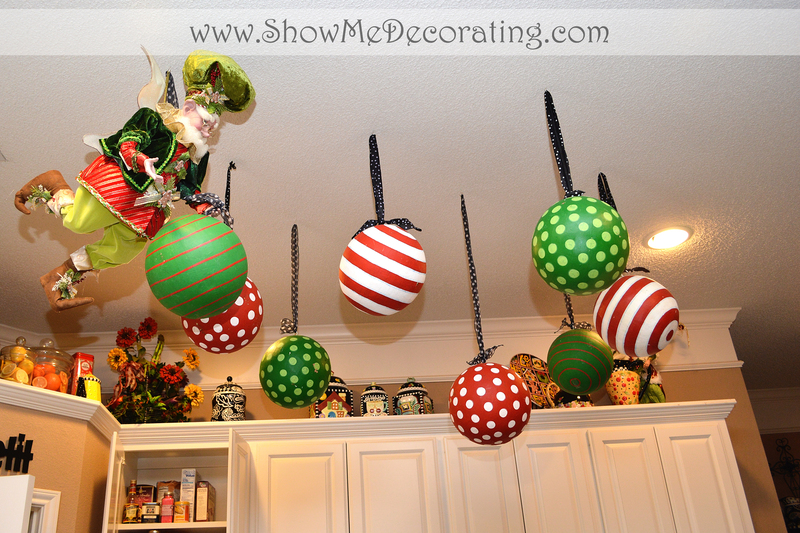 Red, green, and lime green are accented with pops of the Show Me Decorating black and white checked balls. This Christmas brunch was a dream come true to spend time with two of our favorite artist! Mary Engelbreit and Mark Roberts. May you have a blessed and merry Christmas! Show Me a Merry and Bright Christmas Brunch! 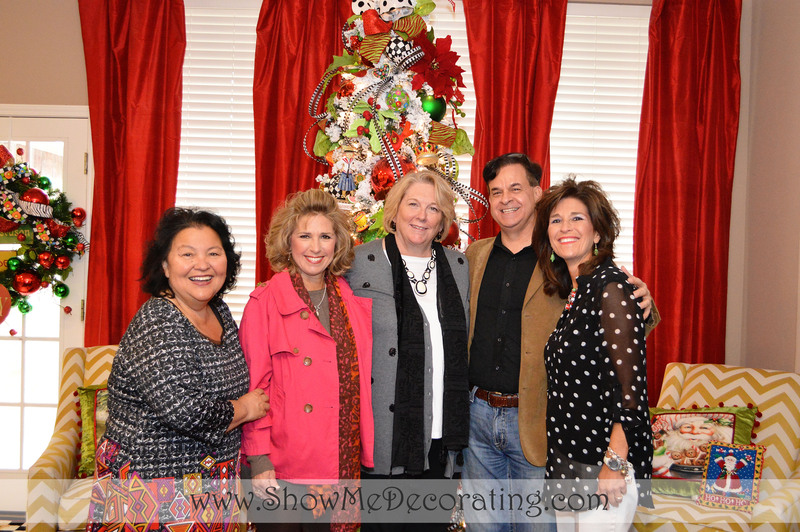 This season Kathy and Becky were honored to host Mary Engelbreit and Mark Roberts for an event signing at Miss Cayce’s Christmas Store in Midland, Texas. Several collectors won the invite to a “private” brunch before the event to meet and greet and have their favorite Mary Engelbreit and Mark Roberts collections signed. Mary Engelbriet fans and admirers enjoying a magical brunch with the artist! 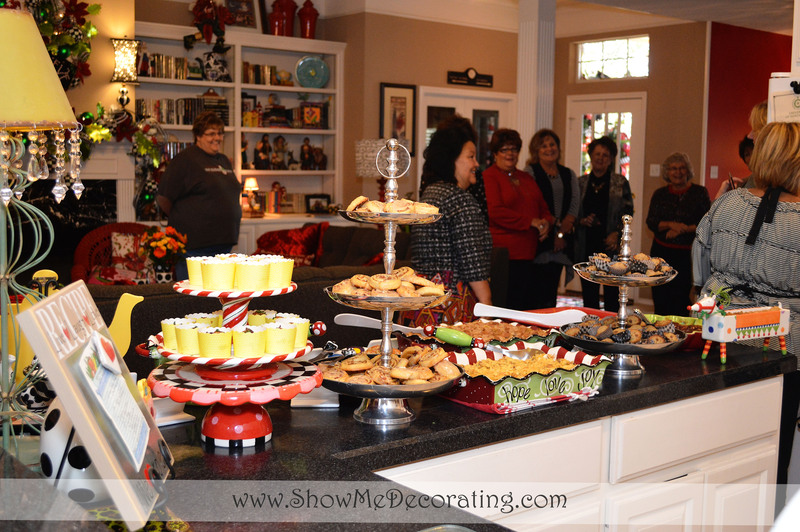 Alta Lynn hosted the brunch in her “Mary Engelbreit” inspired home! Mary Engelbreit arrives at Alta’s “Mary E” inspired doorway! Tip: Mary Engelbreit prints were framed in Dollar Tree black frames and hung on the garland as focal points. Best friends, Tricia and Sheri (also huge Mary Engelbreit fans) prepared amazing delicious brunch dishes. Best friends serve up delicious breakfast brunch creations! 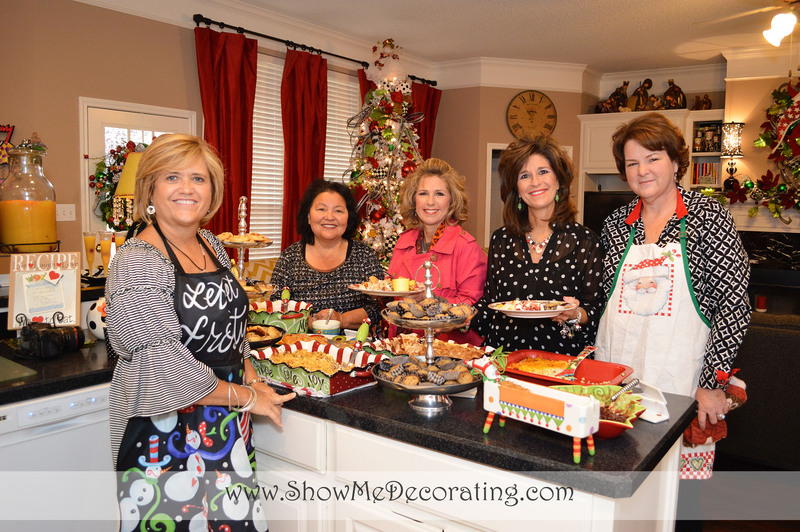 GeorgeAnn and our Show Me Decorating team decorated this home with a whimsical Mary Engelbreit inspired theme. Lots of touches of bold colors paired with black and white patterns of polka dots and Mary’s signature black and white check. The table is set, complete with a “Vintage” Mary Engelbreit girl centerpiece. 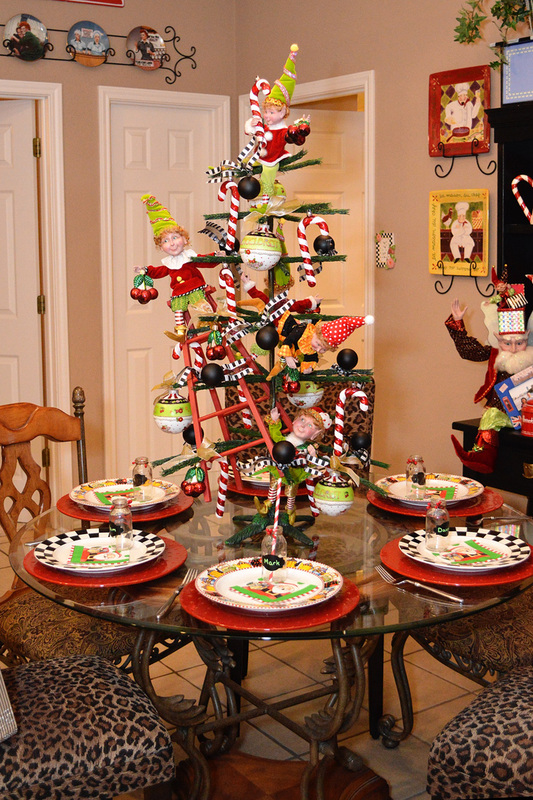 Festivity and fun was inspired by Mark Robert’s fairies, elves and Santa’s and created Christmas magic in this holiday home. Mark Robert’s chooses from the fabulous brunch buffet! 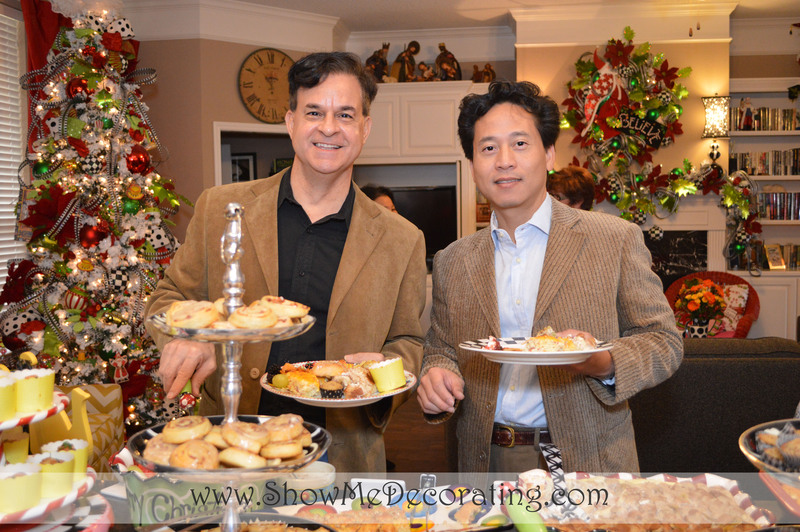 Mark Robert’s and Peter pose with their full plates! 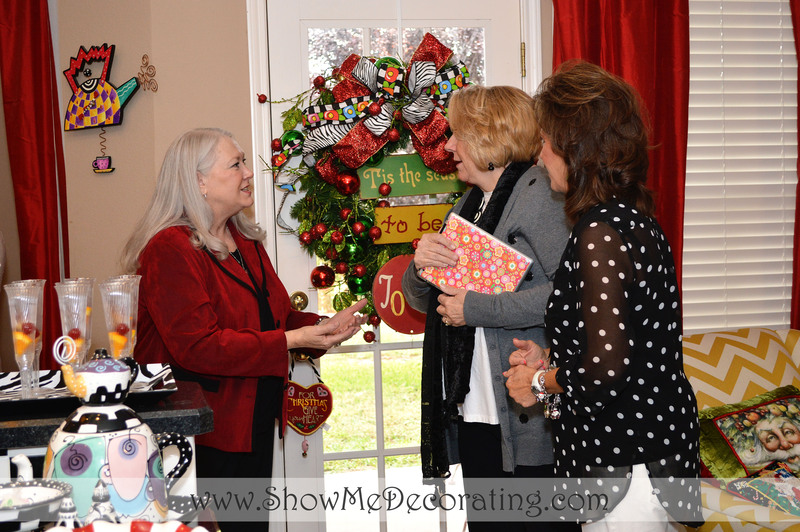 Mary Engelbreit and Becky chat about Alta’s festive house. 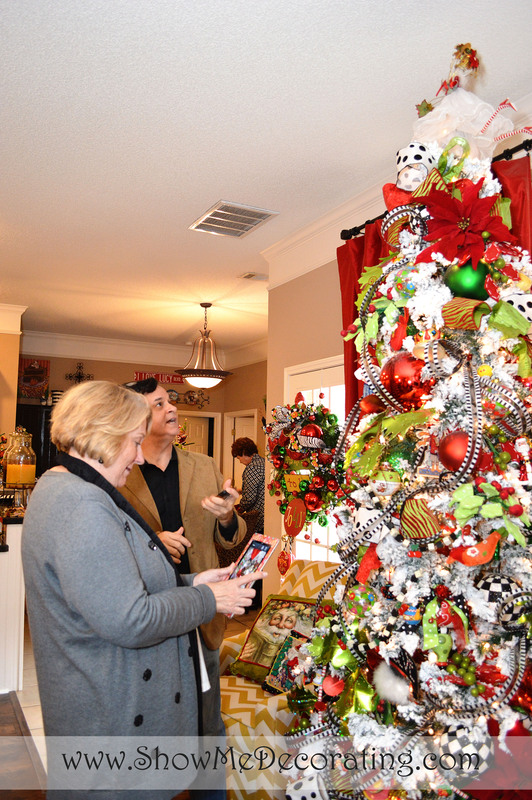 Mary Engelbreit and Mark Roberts admire many of the Vintage Mary Engelbreit decorations. 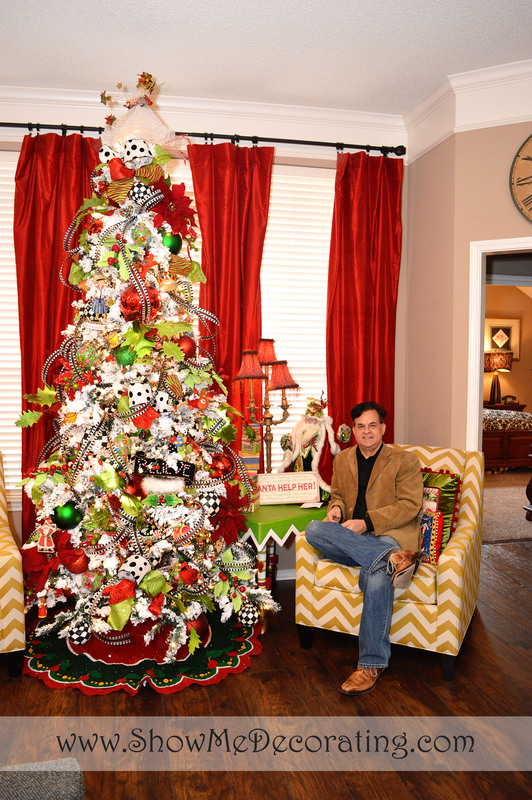 A flocked tree shows off the Mary Engelbreit Christmas tree theme. 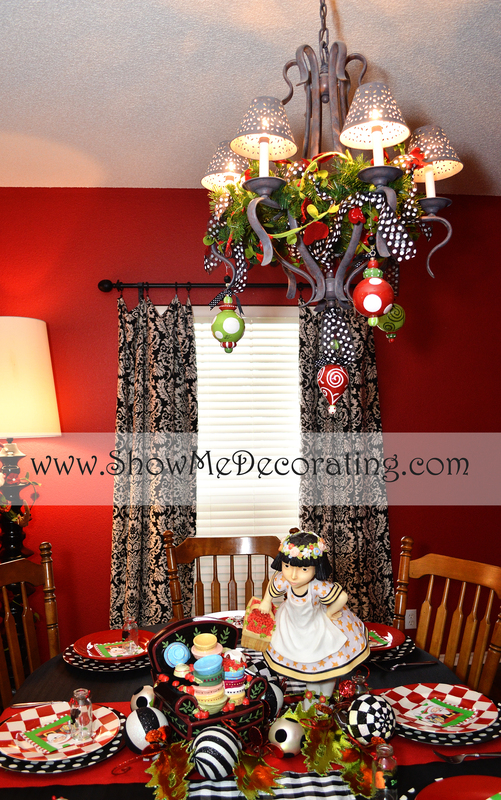 Tip: Carry out your table theme and color story to your chandelier. 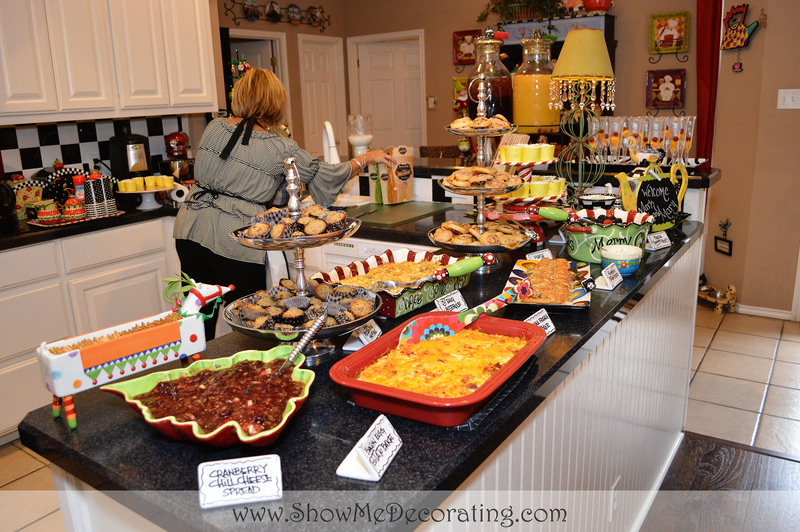 More Show Me Decorating ideas and brunch recipes to follow! We are your Christmas Decorating experts! Thanks for following along! Alta Lynn could not contain her excitement! Mary Engelbreit and Mark Roberts are in her House! Show Me Decorating, Fun and Funky Christmas Tree Theme! A White Christmas tree is a great backdrop for bright colors, red and white candy and spiral floral sprays. Step 1: start with a white Christmas Tree! 2. 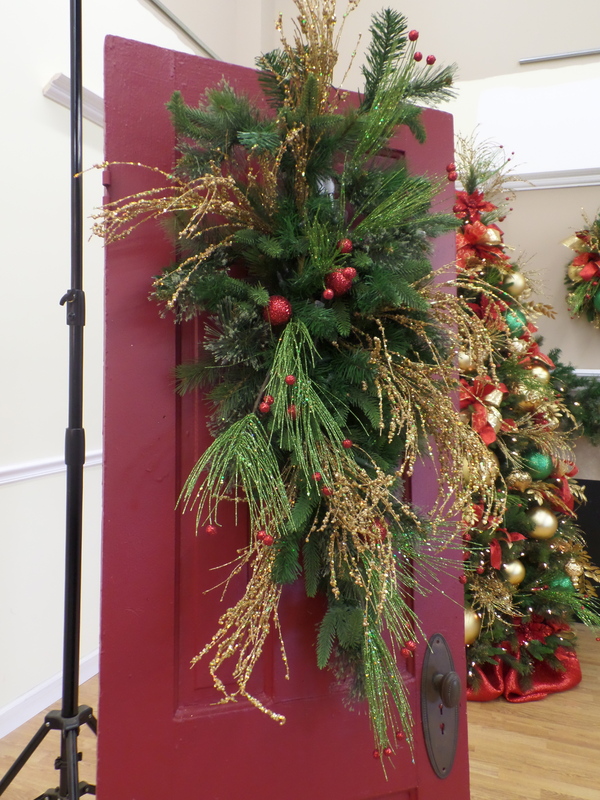 Pick out an assortment of florals, purchase in multiples of 3, and for a 7 1/2′ tree we recommend 12-15. 3. Balls in large to small sizes are a great background base to your Christmas tree. Glitter Mesh Ribbon, wired and easy to make a bow with the Show Me Decorating app! Add in your own favorite collection of ornaments and now you have a Funky Fun Christmas Tree! The step by step instructions are available on the Show Me Decorating DVD or the app for the iPhone or iPad. Show Me A Texas Sized Royal Red and Gold Tree Theme. This tree is reminiscent of a live poinsettia tree. The best of both worlds, live red poinsettias encircle the beautiful Royal Red and Gold Tree Theme, and are low enough to maintain. The tree is filled with permanent botanicals (no watering required!) of big red poinsettias, glitter leaves and sprays. 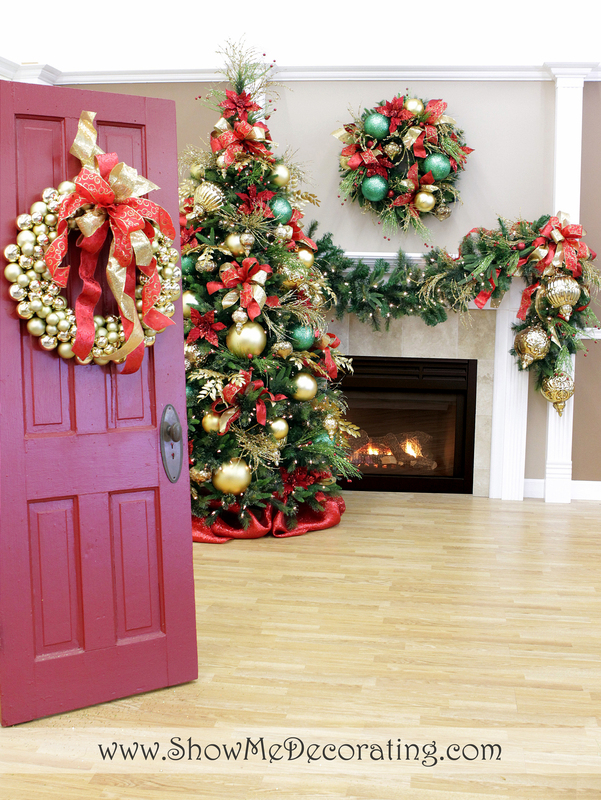 The fresh poinsettias fool the eye into believing this Christmas scene is a real tree! First Baptist Church in Midland was forced to temporarily relocate to the Midland Center, due to a fire, during the Holiday season. 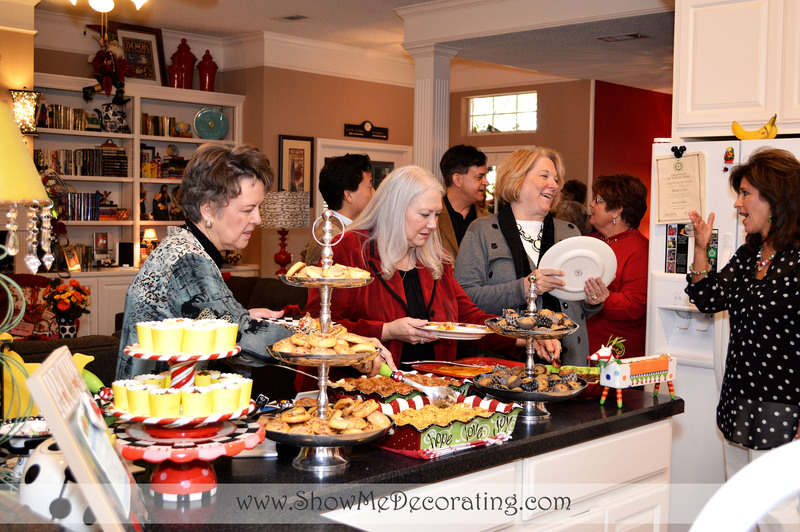 The Show Me Decorating’s Midland team came to the rescue with a plan! 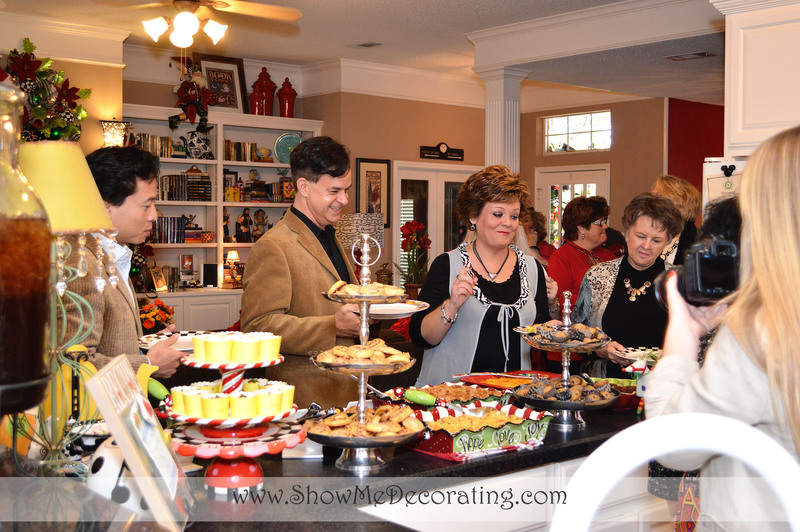 A theme and color story were determined, ribbon, balls and florals were selected. The team kept in mind future decorating needs and the ability to reuse the investment decorating the Midland Center. This beautiful tree will be able to move to the reconstructed church for the NEW season and coordinate with their overall Christmas decorating theme and color story! the best store just got BIGGER!